The all white sheet set has an eye catching pattern of different sports balls ie, (soccer balls, Basketballs, Footballs, etc) all over it. The set includes a flat sheet, a fitted sheet and 1 matching pillow case. The all blue striped sheet set has an eye catching multi colored pattern of different sports balls (soccer balls, Tennis balls, Hockey pucks, Footballs, Baseballs) all over a striped pattern. The set includes a flat sheet, a fitted sheet and 1 matching pillow case. 100% COTTON PERCALE. TWIN set includes: 1 TWIN flat sheet, 1 TWIN fitted sheet, and 1 STANDARD pillowcase. Fun sheets with simple line drawings of cars, trucks, and buses in navy on a white background. 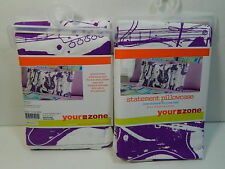 2 Your Zone Pillow Case Purple Guitars Printed Front & Solid White Back 20"x30"
Purple Guitars Printed Front & Solid White Back. · Cozy threads for your bed. · Easy care machine washable. · Material: 60% cotton, 40% polyester. 20" x 30" (51 cm x 76 cm). Twin/Twin XL sheet set includes: flat sheet (66" x 96" (168 cm x 422 cm)), fitted sheet (39" x 80" 12" (99 cm x 203.2 cm 30 cm), Fits mattresses up to 14" deep (35.6 cm)) and 1 standard/queen pillowcase (20" x 32" (50.8 cm x 81.28 cm), Fits pillows 20" x 28" (50.8 cm x 71.12 cm)). 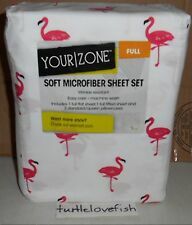 2 Your Zone Pillow Case Quad Skate Printed Front & Solid White Back 20" x 30"
Quad Skate Printed Front & Solid White Back. · Cozy threads for your bed. · Easy care machine washable. · Material: 60% cotton, 40% polyester. 20" x 30" (51 cm x 76 cm). 2 Your Zone Pillow Case Blue City Scape Printed Front & Solid White Back 20"x30"
Blue City Scape Printed Front & Solid White Back. · Cozy threads for your bed. · Easy care machine washable. · Material: 60% cotton, 40% polyester. 20" x 30" (51 cm x 76 cm). 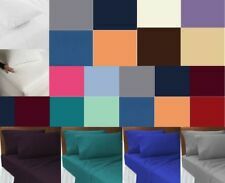 Material: 180 Thread count cotton percale. Twin contains 1 flat sheet, 1 fitted sheet and 1 pillowcase. Pieces Included (Twin): 1 Flat sheet, 1 fitted sheet and 2 pillowcase. Pieces Included (Full): 1 Flat sheet, 1 fitted sheet and 2 pillowcase. Pink with All Over Pink, Purple, Turquoise Unicorns & Starts. 100% Authentic Sleep Zone. 3 Pc Twin Sheet Set. One Flat Sheet (66" x 96"). One Fitted Sheet (39" x 75"). The all light gray sheet set has an eye catching pattern of different sport players ie, (soccer, basketball, football, baseball, hockey) all over it in shades of blues and burgundy. The set includes a flat sheet, a fitted sheet and 1 matching pillow case. Material Details: 85 gsm microfiber. Sleep Zone Sports 4-PC Full Sheet Set - Basketball Soccer Football Baseball Tennis Volleyball. Care Instructions: Machine wash gentle cycle in cold water with similar colors. Tumble dry on low heat. New in original packaging. Full size. 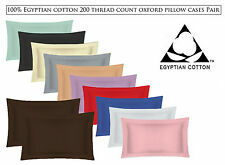 Fits standard pillows Machine washableQuad Skate20 X 30"60% Cotton 40% Polyester. Cotton, Polyester. Box is in Good Shape. 1 flat sheet. 1 fitted sheet. Machine washable. 1 pillowcase. 1 flat sheet. 1 fitted sheet. Color: blue, navy, green and white. Full Sheet set. 1 full flat sheet: 80"x96". 1 full fitted sheet: 54"x75" - fits up to 12" mattress. Dream Space. Machine washable. Content: 100% polyester. One Pillowcase. 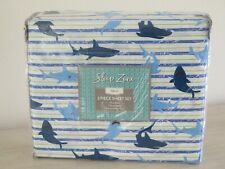 Sleep Zone Twin Three Piece Sheet Set. Sleep Zone. 3 Piece Twin Sheet Set. One Twin Flat Sheet 66" x 96" (168cm x 244cm). 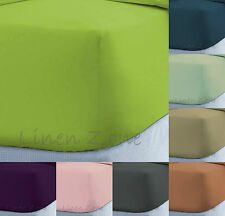 One Twin Fitted Sheet 39" x 75" (99cm x 191cm). One Flat Sheet. 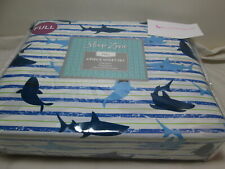 Ocean Life - Sharks, Swimming on a Blue & White Striped Background. One Pillowcase. 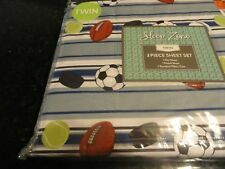 Sleep Zone Twin Three Piece Sheet Set. Sleep Zone. 3 Piece Twin Sheet Set. 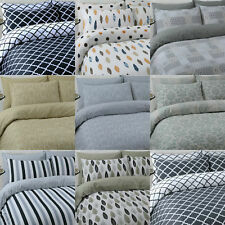 One Twin Flat Sheet 66" x 96" (168cm x 244cm). 100% cotton 180 thread count cotton percale Gingham print Fitted sheet fits mattresses up to 14" Set includes 1 fitted sheet, 1 flat sheet, and 1 pillowcase. 180 thread count cotton percale. 1 Flat Sheet:66x96" 1 Fitted Sheet:39x75 12" 1 Standard Pillowcase:21x30". With super cute multicolored rainbows, stars. one standard pillowcase. suns, and clouds. 100% polyester microfiber. New Sleep Zone. Twin Sheet Set. 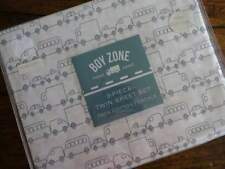 These sheets are perfect for a little boy's room - Dump Trucks and Bull Dozers all over it. So cute! Set includes (1) Flat sheet, (1) Fitted Sheet and (1) Standard Pillowcase. 100% Cotton. 3 pieces include 1 pillowcase, 1 flat sheet, and 1 fitted sheet for a twin mattress (39" x 75"). This sheet set has a bright colorful design of carpenter tools. Machine wash. By Boy Zone. Full Sheet set. 1 full flat sheet: 80"x96". 1 full fitted sheet: 54"x75" - fits up to 12" mattress. Dream Space. Content: 100% polyester. ALL STARS SPORTS.